Camp of Approval - who’s afraid of the big, bad woods? who’s afraid of the big, bad woods? What’s up, campers? I’m looking at you, people who camp all year long, in any kind of weather. You camp in the muggiest of summers and the frostiest of winters. You brag about camping in the Rocky Mountains with nothing but a hand towel for a blanket and a wad of fishing line to snare dinner. You probably camp naked in January, keeping warm under layers of snow and pine needles, sharing the body heat of several muskrats you humanely captured and then befriended just like our noble neighbors to the north, the Eskimos, have done for over 5,000 years. I know nothing about the outdoors. Or animals. Or history. I want to spend a week sucking in fresh air and campfire smoke. I want a healthy glow in my cheeks from outdoor exercise. I want to stroll up to a majestic black bear and scratch that cuddly guy right behind the ears like it’s no big deal! I haven’t gone camping since I was about 12, and you really can’t call that camping. I went to a campground with my aunt and cousins and there was an outdoor swimming pool and a small arcade with Ikari Warriors. Basically, we paid money to sleep in a tent 40 feet from a snack shop. But hey, I didn’t shower and there was a campfire involved. You can’t argue with that. I have never really (truly) felt like camping, yet I feel I should want to go camping. Everyone I know loves it. Honestly, I love the idea of it. I genuinely like being out in the woods. I like trees and rivers and animals and seclusion and meat-based meals cooked over a fire I ignited by banging rocks together over dry leaves (or by using matches I pulled from a very outdoorsy looking waterproof cylinder). And what about fishing? People fish while they camp, right? Of course they do – unless all those Hardy Boys adventure books lied to me, in which case screw you, Franklin W. Dixon. But if one can trust Mr. Dixon’s well-crafted paragraphs, I’d like to go fishing whilst on my theoretical camping trip. Fly fishing. I want to whip a giant, fuzzy lure back and forth over my head for no discernible reason and then catch a trout big enough to feed my whole family without risk of parasitic infection. And hiking! I want to lace up my boots early in the morning and lead my little camping family up ridges and down valleys and across rivers o’er yonder. I want to forge trails, man! Is this too much to ask? Can’t a guy like me do a little forging around here? I feel like I should want to go camping. But bugs and humidity and figuring out where to go and what to pack ... the thought of all this is enough to knock me from the daydream. But it’s not hard, right? We’ve got great campsites all over the place, right? 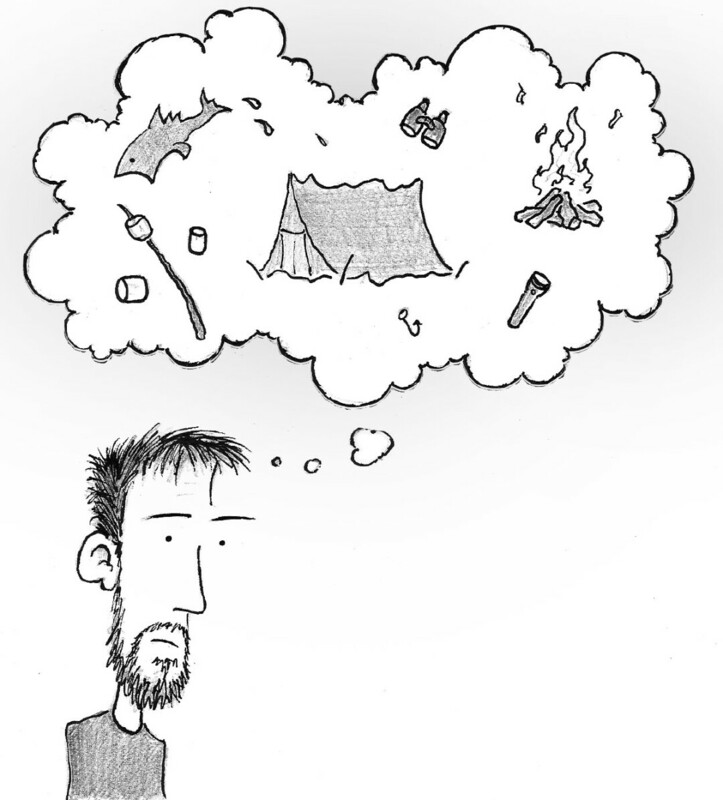 And all you need to pack is a tent, some sleeping bags, some outdoorsy looking matches, a huge freaking survival knife, night vision goggles, a high-powered hunting rifle, a solar-powered beer cooler, and a collapsible cup, right? I’m pretty sure I can borrow most of that. I owe it to myself and my family to give it a shot. So if you know of a great campsite for beginners, please send me an email (mike@volumeone.org) and use the subject line JUST SHUT UP AND GO CAMPING, YOU BIG BABY. Bonus points if the place has cuddly majestic black bears.